E-Z elegant romantic sensational, great for Valentines’ Day, or anytime fresh crabs are available. 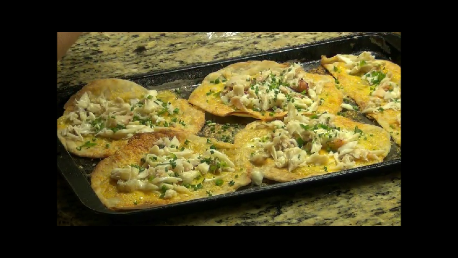 Spectacular flakey layers of tortillas and crab. Best with home-made tortillas that can be made ahead, recipe below. Make sure crab is at room temperature before starting. Brush tortillas with butter on both sides. Partly brown in 350°-400° oven. Turn over for even toasting. In my oven this takes about 5 minutes or less on each side. Remove from oven. Sprinkle cheese evenly on each tortilla. Return to oven until melted. Remove from oven top evenly with crab and greens. Last picture above goes to a short video of this recipe. The pictures below go to the Organic White Flour Sourdough Tortillas recipe.